New arcade game on the way? It’s been a week of teasers for SEGA Nerds everywhere, with Retro-Bit announcing and teasing new SEGA accessories at CES last week and also SEGA teasing a new game from their partnership with Two Point Studios on social media (the announcement published just earlier today!) and just yesterday, SEGA published a new Japanese teaser site, which has had the team here at SEGA Nerds more than a little curious. 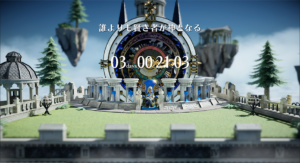 The teaser site shows some sort of floating isle, with a time/clock motif going on. In the centre is a huge clock face, counting down to the launch of the site, with a digital countdown on display. If you look closer, you can see a throne in the centre and running along on both sides of the throne are, what appears to be, hourglasses/sand timers. Scroll down a bit and you’ll see something that resembles the top of castle battlements, with Roman numerals on them. And if you wait around for a few seconds, a little figure appears, sitting on the throne. Also the clock has several timings on its face, with the largest, outer dial reading (going clockwise from the top) XII (12), XVIII (18), the next is obscured, and finally VI (6). I have no idea what those numbers relate to, or what kind of timer that could be – but I assume it’s important to the game. From an initial look, there has been some speculation as to what game this could be teasing. Some have suggested a new NiGHTS game, based on the art style – others have suggested a Skies of Arcadia, due to the floating islands. But, we would suggest not to get too excited by the thought of a new NiGHTS or Skies of Arcadia game being on the cards, because we don’t think it will be either. Firstly, the website is owned/operated by SEGA Interactive Inc., SEGA Japan’s arcade and amusements business; so the mostly likely situation is that this is a new arcade game coming to Japan. Secondly, the teaser webpage’s address is “Senki.SEGA.jp” – according to a quick online translation, “Senki” means “Military History.” Honestly, I have no idea what that could mean for the game. But I can’t see it relating to either NiGHTS or Skies of Arcadia. As I say, they are along the same lines, but it seems the line doesn’t translate perfectly into English, though it does tickle my interest (anyone fluent in Japanese, might want to get in touch and let us know what it says!). So, keep an eye on the page, we expect some things to change. Perhaps that little person on the throne moves around, or changes? We’ll keep you updated as more information comes in.